Personas are how we distill all the individual users’ data we collect, into broad characterizations of our users. A persona is a made up user who has the characteristics, wants and goals of actual users that we’ve talked to. A persona represents a group of users. We create the persona by looking for patterns in those characteristics, wants and goals, and they making some general assumptions about who our “typical” user is. That typical user is a persona. 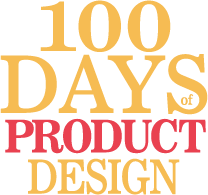 We use personas to clarify who we’re designing and building for, and why. Each persona represents a significant portion of people in the real world and enables the designer to focus on a manageable and memorable cast of characters, instead of focusing on thousands of individuals. 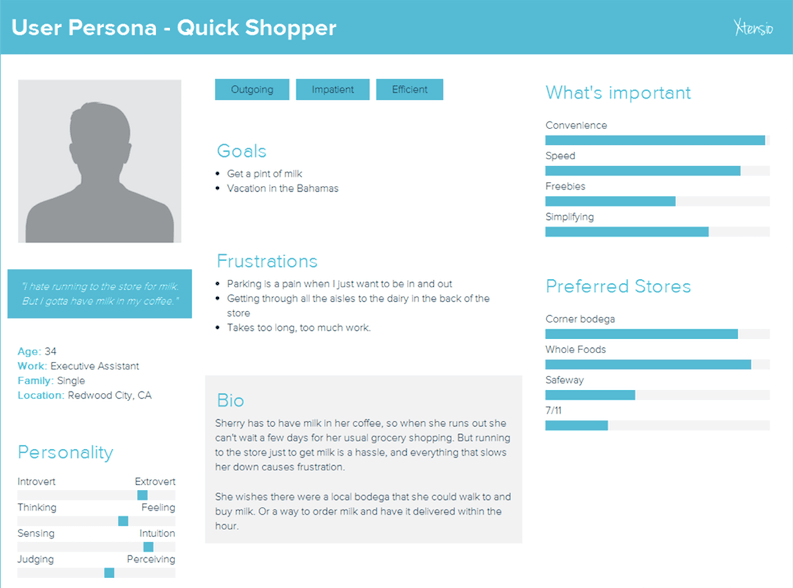 Personas are a UX tool that looks easy and obvious and turns out to be hard and complicated. In the beginning, you might think a persona is just a person who uses your application. Maybe it’s one of the users that you talked to. That’s a rookie mistake that many new designers make. Personas are not real people, there a representation of real people, based on a lot of collected data. How do you make personas? We make personas by looking for patterns in the empathy map and user journey data we collected. How many customers are annoyed by having to go to the store when all they need is a quart of milk? Do a lot of customers wish the milk were at the front of the store instead of the back so they can get in and out quickly? Are many of them irritated that parking is hard to find when they’re in a hurry? If so, then you’re seeing the beginning of a persona. Persona #1: The person running to the store for a pint of milk I’d call my “quick errand” persona, because this type of customer is in a hurry and is focused on getting in and out of the store as fast as possible. For this persona, I’d think about how to make quick shopping trips more convenient. Persona #2: But you might find there is a whole other persona for a customer at the grocery store. The person who is doing his weekly shopping, has plenty of time, wants to explore every aisle and buy a lot of groceries. Persona #3: There might be even more personas. What should go into a persona? Less is better. Some designers get detailed with pictures, hair color, wishes and dreams… but all you need are the key distinguishing features that make this type of customer a unique type of user. Do you really care if Sherry is single or has three kids and was divorced last year? Not unless bringing the kids with her to the store is one of her pain points that you can solve. As you conduct interviews, design ethnographies, and make more empathy and journey maps, the number of personas for your product will become clear. Be specific, but only include the details that matter: if hair color or gender are not important to the product you’re designing, don’t put them in your persona. Don’t forget the persona’s goal. What are they trying to accomplish with your product? Who is your main persona? The user you must satisfy first? If you have more than 5 personas, you have too many. Consolidate. Don’t get carried away. Only include information that impacts your designs. If you’ve got more than 5 personas, you probably have too many. Look for overlap and and combined them into a single persona. Sometimes you want to identify the people that you are not designing for. Based on the empathy maps and user journeys, create the personas for your coffee shop experience. Identify your primary persona — what kind of customer is the main customer your coffee shop serves? Make your personas as detailed as you want, but be sure the information you include is relevant to the designs. Create a pdf and share your personas in the comments and/or on Dribbble and Twitter #100daysdesign.